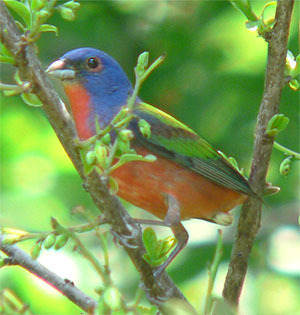 Painted Buntings at Ringtail Ridge: Who Knew? 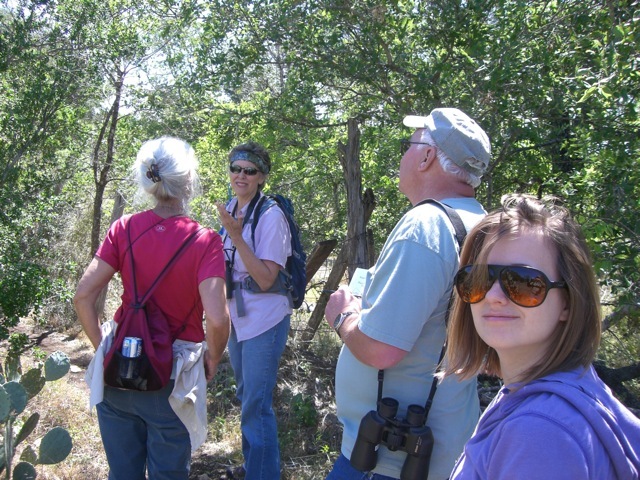 An SMGA-sponsored birding hike on May 14th at Ringtail Ridge Natural Area led to the discovery of painted buntings residing in the Ridge Loop section of natural area. Binoculars in hand, the bird’s distinctive call was pinpointed to a female painted bunting. Then another. Finally a colorful male was located at the crown of a live oak. A dozen hikers led by master naturalist Bonnie Tull sighted a birds that were also identified in a survey conducted October 2008 in which 25 different birds were seen or heard. The May 14 expedition netted numerous finches flitting on the thistles, blue jays in the woods, and wrens in among the cactii. The usual mockingbirds, titmouse, cardinals and chickadees were also identified. Bonnie shared ways to encourage a diversity of birds, including bluebirds, and capitalize on bird watching opportunities in local landscapes. This information will be put to good use by SMGA’s stewardship committee.